Doori is a 3lb. (beetle-weight) vertical bar spinner designed and constructed between the Fall of 2018 and Spring of 2019. After a moving dance competition between both robots, the Judges came to the difficult decision that Doori was the victor. Skids got caught in the rough ground and the damaged arena floor. Ramp extended beyond the range of the weapon and prevented opponents from making contact with the weapon. 1/4" HDPE plastic armor did not work as intended. Instead of deflecting hits, chunks were taken out of the armor. Wheels and weapon belt were exposed. Had trouble with the tension of the weapon belt. Hobbyking weapon ESC did not work. Turnigy ESC worked. Because all the weight was concentrated in the center, It was very difficult to maneuver. Armor was lightweight and reliable (for at least 30 seconds of uptime). Easy to replace. Skids need to glide on potentially rough surfaces. Invertibility - taller wheels, shorter chassis, skids on top. Front plastic should only be used as armor. The addition of the upside down ramp on top appeared to help prevent flips. However, Doori did not suffer any massive hits during its second competition, so it is difficult to say if the upside down ramp totally prevented flips. The design behind Doori is inherently flawed and can't be improved upon without major changes to the design of the Robot. Team Doori does not recommend using Doori as a starting template for a vertical bar spinner. (Please start from scratch). One major benefit to Doori was that it proved plastic armor is a viable option for absorbing some hits. Team Doori advises vertical bar spinners to consider where their weight is concentrated. 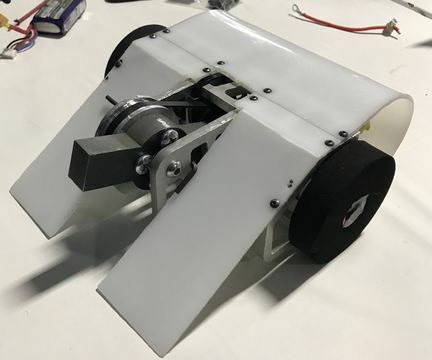 Because the weight of plastic is so light, teams may be tempted to let the weight concentrate towards the center which, like Doori's case, could make steering very difficult. Thomas Jackson (Thanks Thomas) - Not our mentor, but also basically our mentor. Really helped team Doori through it's darkest moments with some solid ideas (Thanks Thomas). This page was last edited on 13 April 2019, at 22:27.